I have this grandson named Anderson. Recently I told Anderson’s father (my son), that his child had to be part cat. He’s bound to have nine lives and, as best we can estimate, he’s used five of them thus far. That we know of. And he’s only eight. I won’t recount the previous four; although two of them were gross but not gag inducing, two of them have caused people’s eyes to get really big and their hands to instinctively go to their mouths in horror. But this last one. Oh, this last one . . .
A few weeks ago Anderson, who loves to climb anything, but mainly trees (yet another cat-like quality), managed to work his way up about 15 or 20 feet into the neighbor’s Magnolia tree. 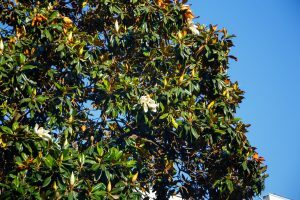 I should clarify that this is basically the neighborhood tree that just happens to be located in someone’s front yard, and every child up and down the street knows they have perpetual permission to climb said Magnolia. But on this day, Anderson climbed higher than he should, to that point where the branches are still young and green . . . and bendy . . . and thin. And he fell. Actually, I contend the tree dropped him because the branch upon which he was standing broke, and the branch he grabbed to keep from falling also broke. And Anderson hit the ground from about the height of a two story window. The end result was two fractured bones in his left arm, close to his wrist (fortunately, he’s right handed), two to four cracked ribs (compliments of the branch he hit on the way down . . . the branch that probably saved his life), a tiny skull fracture on the left side of his noggin, just behind his ear, and a small brain bleed—and a night as a patient at Le Bonheur Children’s Hospital. He was released the next afternoon with instructions for follow-up appointments for a cast and another CT scan—and, of course, the usual in-room doctor/parents conference. That evening, when bedtime rolled around, as tired as the little fellow was, he didn’t want to go to bed. And he certainly didn’t want to go to sleep. When his exhausted parents asked why not, he told them he heard the doctor say that, due to the brain injury, he might forget some things during the coming week, and he was afraid if he went to sleep he wouldn’t know who they were when he woke up. I’m sure the doctor never once thought that Anderson was listening. I’m sure his parents never thought he would take that simple remark to the place he did. But Anderson was listening . . . and he did understand . . . up to a point. Then his train of thought got seriously off track. And therein lies the lesson we need to apply on so many other occasions. One of the most life-altering events in a child’s world can come when Death claims someone they know and love. As you discuss that death with other family members and friends, remember, the walls have ears—and so do the little ones. Children share some of the same qualities that make for a good ninja, and they generally exhibit those when you least expect it—or want it. Your comments to others, your descriptions of what transpired, your observations about that person’s life, all are fair game for children to take in and process—and if they don’t have a clear understanding of what you said . . . and what you actually meant to say—you have just compounded the problem. It may be a tall order, but we should always be aware of our surroundings when conversing with others and choose our words with care. Children may not come when we call them to supper. They may not respond when we tell them to clean their rooms. But we need to remember they are constantly watching and listening—especially when we don’t think they are.